1The authors are with Instituto de Telecomunicações, Department of Electrical and Computer Engineering, Instituto Superior Técnico, Universidade de Lisboa, Av. Rovisco Pais, 1049-00/1 Lisboa, Portugal (e-mail: fcarvalho@lx.it.pt). 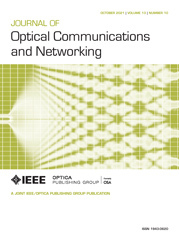 A method is proposed to determine the theoretical optimal electrical power distribution (OEPD) among several orthogonal frequency division multiplexing (OFDM)-based signals transmitted in coexistence in radio-over-fiber. The method is based on a theoretical analysis, which takes into account the influence of the frequency-dependent loss of the channel and individual bandwidth and performance requirements of the signals on the performance of the signals. The method is experimentally validated for a bundle of five coexisting OFDM-based signals, which are used to deliver a quintuple-play service to each user in a wavelength division multiplexing long-reach passive optical network (LR-PON). The theoretical and experimental OEPDs are obtained, and the discrepancy between them is assessed. When the system parameters are set for best performance, the discrepancy does not exceed 10% in six of the seven transmission scenarios considered, indicating that the effect of nonlinear distortion on the OEPD can usually be neglected. More importantly, for fiber lengths close to the maximum transmission reach [situations in which it is more relevant to optimize the electrical power distribution (EPD)], the proposed method provides accurate estimates of the OEPD. Using the OEPDs, the provision of five OFDM-based signals in coexistence is experimentally demonstrated. Specifically, using 16- and 4-quadrature amplitude modulation (QAM) in the fixed Internet access service enables network reaches up to 122 km and more than 130 km of standard single-mode fiber, respectively. Compared with a reference EPD (equal power distribution among the coexisting signals), the use of the OEPDs results in an improvement of 20 and 28 km in the network reaches using 16- and 4-QAM in the fixed Internet service, respectively. a OEPDs obtained by using the values of Tables II, III, and IV in Eq. (6).